It measures 80″x50″x38″ with 28 sq. ft. of interior space. It measures 34″x78″ and fits up to 6’4″. This entry was posted on Monday, January 23rd, 2012 at 08:00	and is filed under Camo, Military, Survival. You can follow any responses to this entry through the RSS 2.0 feed. Both comments and pings are currently closed. 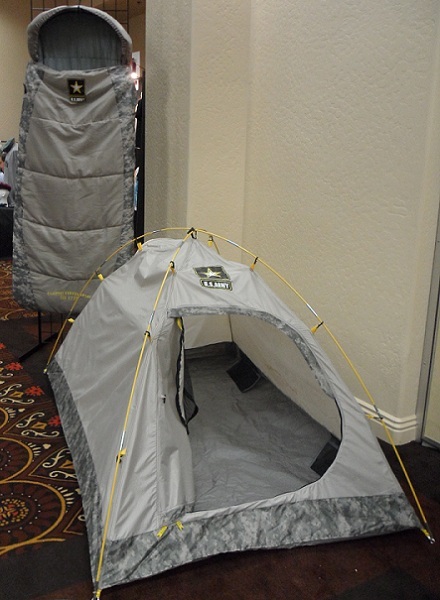 Until it comes with an angry Drill Sergeant and a battle buddy that likes to fall asleep on fire guard I’m not buying. And fire ants. Gotta have the fire ants. YES, fire ants… you can’t really get the true experience without those little bastards!